Six of Houston's Newest Inner Loop Luxury Apartments including, 36sixty, Broadstone West Eighteenth, Avanti Cityside, Bayou on the Bend, Metropole and The Bel Air. A Unique, fresh lifestyle that breaks with traditions. At 36sixty you'll discover a world-class, self-contained urban adventure. Bold. Daring. Innovative. 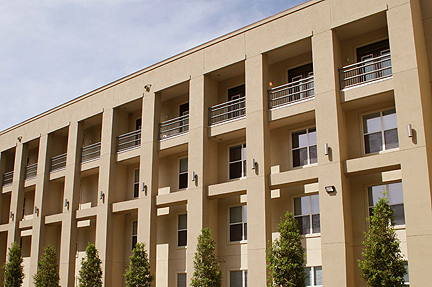 Behold the five-star amenities inside and out, the modern designs and spacious floor plans. Far more than luxury apartments. 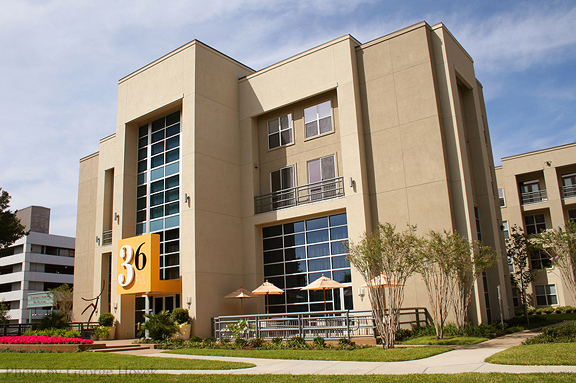 36sixty is an interactive social center and urban resort lifestyle set in the heart of Houston's inner loop. 36sixty. Live it. 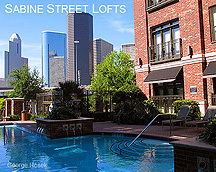 Located on the edge of Downtown Houston and just minutes from Metro-Rail and The Medical Center. Avanti Cityside is close to the excitement yet far from the chaos. That's why it's called an Urban oasis. Stately palms swaying in the breeze. Infinity pool cascading into a tranquil pond. The gentle splash of fountains. St Tropez? St John? An island getaway? 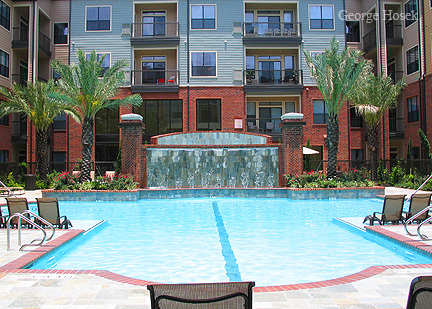 No, just one of two lavish poolscapes at Avanti Cityside. Add WiFi, summer kitchens and barbeque grills, and you're suddenly living the resort life. At Club Avanti, you choose whether to work or play. 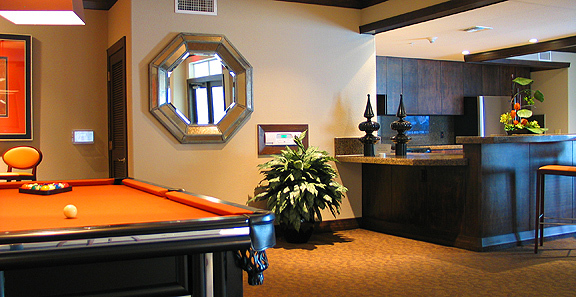 Hang out in the activity room with billiards and video gaming. Handle business in the Conference Room. Or have it both ways in the internet lounge. And forget the typical workout room. At Club Avanti, you've got 1900 square feet to feel the burn. Discover a new direction...at Broadstone West Eighteenth. Chart your course to a fresh perspective, a perfect destination that melds convenience, luxury and a cosmopolitan style of living. Set your sights on the advantages of an ideal location. Close enough to feel the pulse of the city and be a part of its hot spots and cool venues, but tucked away in a peaceful enclave of your own. 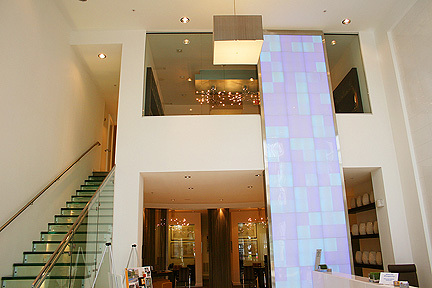 In this calm tranquil retreat, your are surrounded by lavish luxury and the most modern amenities. Find your niche...revel in the instant gratification of exceeding your expectations. Delight in plush surroundings and up-to-the-minute details. 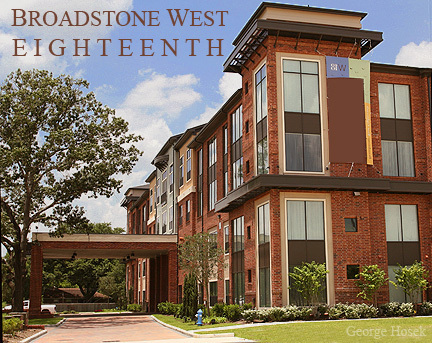 Map out a bright future and find yourself at Broadstone West Eighteenth. Where Uptown meets Downtown. At the center of everything but in a world of it's own, Metropole melds cosmopolitan elegance with up-to-the-minute luxury. From chic contemporary interiors with the latest upscale touches to captivating views that remind you why you live in the city - Metropole is designed to please today's connoisseurs of the good life. Located on the banks of the Buffalo Bayou, amid towering trees, with spectacular skyline views, Bayou on the Bend offers the ultimate amenities: earth, sky and water. At Bayou on the Bend life is in balance. Urban enticements and scenic surroundings. Cosmopolitan style and natural beauty. Choose from over 60 floor plans with customizable interiors and fine finishes. 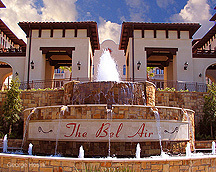 Plus every luxurious amenity to gratify mind, body and spirit.